Department of Anatomy, Kasturba Medical College, Manipal University, Manipal-576104, Karnataka, India. Increasing activity in the fields of cardiac and vascular surgery has revived interest in the developmental and adult anatomy of the aortic arches and the great vessels derived therefrom. The arch of aorta is a continuation of the ascending aorta, located in the superior mediastinum. Three branches, the brachiocephalic trunk, left common carotid artery and left subclavian artery usually arise from the arch of aorta. The brachiocephalic trunk later divides into right common carotid and right subclavian artery. A study was therefore conducted in the Department of Anatomy, Kasturba Medical College, Manipal to study the branching pattern of the arch of aorta. 40 cadavers of both sexes (aged 35-65 years) were included in the study.The thoracic cavity was exposed, lungs were removed, superior vena cava and brachiocephalic veins cleared and pericardium were uncovered to expose the ascending aorta. Fibrofatty tissue and nerves were removed to clarify the branches of the arch of aorta. The arteries were painted and allowed to dry and then photographed. The variant patterns were tabulated. In the present study 85% of the cases showed normal branching pattern, and variations was found in 15% of the cases. The arterial pattern was congregated into four categories based on the frequencies of variations. Prior identification of these vascular anomalies through diagnostic interventions is crucial in order to avoid complications during heart and vascular surgeries. The arch of aorta is a continuation of the ascending aorta, located in the superior mediastinum. Three branches, the brachiocephalic trunk, left common carotid artery and left subclavian artery usually arise from the arch of aorta. The brachiocephalictrunk later divides into right common carotid and right subclavian artery . Most of the anomalies of the arch of aorta and its branches are as a result of altered development of primitive aortic arches of the embryo during the early gestation period . Increasing activity in the fields of cardiac and vascular surgery has revived interest in the developmental and adult anatomy of the aortic arches and the great vessels derived therefrom. The variations of the branches of the arch of the aorta are usually associated with abnormalities of the heart and persistent fetal conditions. Many variations are due to different modes of transformation of the primary vessels of thebranchial arches, especially the fourth. Since the aorta and pulmonary artery develop from a common conus arteriosus, irregular and imperfect development of the septum betweenthem may also produce variations . Reported variations in the aortic arch branching pattern include left common carotid artery originating from the brachiocephalic trunk; right common carotid artery and right subclavian artery originating individually from the aortic arch [4,5]. Additionally, left common carotid and left subclavian artery may have a common origin in the form of the left brachiocephalic trunk from the aortic arch. The left vertebral artery may also arise between the left common carotid artery and left subclavian artery . Understanding the great vessels of the aortic arch and their variations is important for both endovascular interventionistsand diagnostic radiologists. An understanding of the variability of these arteries remains most important in angiography and surgical procedureswhere an incomplete knowledge of anatomy can lead to serious implications. This has become more important inthe era of carotid artery stents, vertebral artery stents, andtherapeutic options for intracranial interventions . Table 1: showing the types of variations in the Arch of Aorta. Variations of the great arteries in the thoracic region are well known and the aortic arch is one of them. Aortic arch anomalies may also be attributed to chromosomal abnormalities. Momma et al  noted that aortic arch anomalies are associated with chromosome22q11 deletion. In 65–80% of cases, three branches arise from the arch of the aorta - the brachiocephalic trunk, the left common carotid artery, and the left subclavian artery. This pattern was described by Adachi  as type I. Eleven per cent of cases exhibited type II pattern,which consists of only two trunks arising from the aortic arch - a common trunk for the left common carotid artery and brachiocephalic trunk, and the left subclavian artery. Three per cent of cases showed type III pattern with four branches - brachiocephalic trunk, left common carotid artery, left vertebral artery, and left subclavian artery.Other variations in the branching pattern of the aortic arch were found in < 1% of cases, These were further sub typed by many other authors in their respective studies [10,11]. Non-recognition of a critical aortic arch branch variation at surgery may lead to fatal consequences. Knowledge of the embryonic aortic arch system is therefore required to understand the development of anomalous branches arising from the arch of aorta . In the present study 85% of the cases showed normal branching pattern, and variations was found in 15% of the cases. These variations are likely to occur as a result of differential developmentof certain branchial arch arteries during the embryonic period of gestation . Table 2: Showing the incidences of the types of variations in the branching pattern of the arch of aorta. TypeII presented with only two branches arising from the arch of aorta i.e. A common trunk branching into brachiocephalic trunk and left common carotid artery. The left subclavian artery was however arising separately from the arch of aorta (Figure 2, 3, 4).Developmental anomalies in aortic arch branching pattern arise from unusual patterns of development of the embryonic aortic arch system of the pharyngeal arches, such that there may be persistence of aortic arches that normally disappear or disappearance of parts that normally persist . Several kinds of uncommon defect occur when arches persist instead of becoming obliterated or vice versa. The proximal part of the third aortic arch normally gets extended and absorbed into the left horn of aortic sac. If it gets absorbed into the right horn of the aortic sac, it can lead to anomalies where the left common carotid artery arises from the brachiocephalic trunk.Similar reports were documented by Natsis et. al. , Paraskevas G. et al  Gupta and Sodhi , and Satyapal et.al. . Accidental occlusion of this common trunk may have major ischaemic complications given that it supplies both carotids, right vertebral and subclavian arteries. Further this variation is associated with cardiac and coronary arterial abnormalities. Understanding the pathophysiological effect of the common trunk is important when planning palliative or corrective procedures and when assessing the potential benefit of surgical repair over the long term . Type III revealed the left vertebral artery arising from the arch of aorta in addition to the other normal branches. This suggests that part of the arch of aorta may be arising from the 7th intersegmental artery or may be due to increased absorption of embryonic tissue of left subclavian artery between arch of aorta and the vertebral artery . According to Bernardi and Detori, the unusual origin of the VA "may favor cerebral disorders because of alterations in the cerebral hemodynamics" . Such anomalies can cause ischemia as well as infarction of the brain stem and cerebellum if the vertebro-basilar axis is left dominant and communication at the arterial circle of Willis is poor . Detecting the variations in the origin of the left vertebral artery and other arteries is beneficial in the diagnostic improvements before vascular surgeries of supraaortic arteries and is also useful in planning aortic arch surgeries or endovascular interventions . In type IV, the brachiocephalic trunk was absent with the right subclavian and right common carotid arteries arising directly from the arch of aorta. The anomalous right subclavian artery ran obliquely from left to the right side between the oesophagus and the vertebral column to reach the right upper limb. (Figure 5) The origin of the retroesophageal right subclavian artery as the last branch of the aortic arch is often seen as a congenital aortic arch anomaly. The reported frequency of this anatomical variation is about 0.4-2% . The possible embryological basis of anomalous origin of the right subclavian artery is the early involution of the right fourth aortic arch and the cranial part of the right dorsal aorta. Consequently, the right subclavian artery develops from the right seventh dorsal intersegmental artery and from the distal segment of the right dorsal aorta . As development continues and the arch of aorta forms, a differential growth shifts the origin of the right subclavian artery closer to the left subclavian artery. Bergman et al , stated that, the right subclavian artery may arise directly from the arch of the aorta, as the first, second, third, fourth or fifth branch. Surgical reports from clinical cases show that, anomalous arteries are more prone to atherosclerotic degeneration. In elderly patients an anomalous right subclavian artery occasionally becomes tortuous and can compress the trachea or the oesophagus causing dysphagia lusoria [21,22,23]. Whereas if foundin front of the trachea, it may cause complications during tracheostomy. Moreover, an anomalous right subclavian artery may be associated with a diverticulum of the aorta or, it may give rise to aneurysms [24,25]. The anomalous right subclavian artery may be accompanied by variations in the course of the recurrent laryngeal nerve. In such cases the right recurrent laryngeal cannot form a loop around the right subclavian artery and it is called “non recurrent laryngeal nerve” . Clinicians and surgeons should be aware of aortic arch variations. Prior identification of these vascular anomalies through diagnostic interventions is crucial in order to avoid complications during heart and vascular surgeries. Standring S. Gray's Anatomy. 39th ed. Edinburgh: Elsevier Churchill Livingstone, 2005: 1021-3. Nurru L, Mligiliche, Nithila D Isaac. A three branches aortic arch variant with a bi-carotid trunk and a retro-esophageal right subclavian artery. Int J Anatom Variations 2009;2:11-14. Anson BH. The aortic arch and its branches. In Cardiology. Volume 1. New York: McGraw-Hill; 1963:68. Shiva Kumar GL, Pamidi N, Somayaji SN, Nayak S, Vollala VR. Anomalousbranching pattern of the aortic arch and its clinical applications. Singapore Med J. 2010;51:e182-e183. 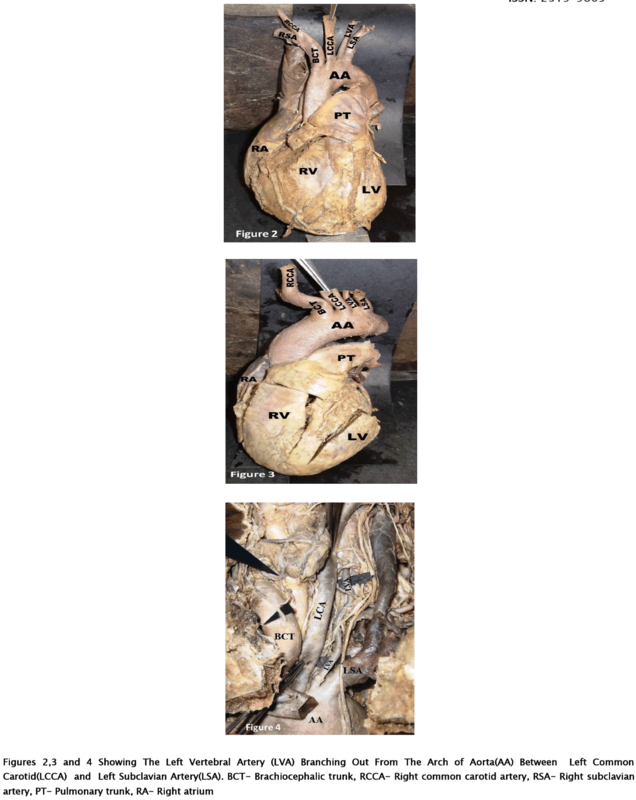 Nayak SR, Pai MM, Prabhu LV, D'Costa S, Shetty P. Anatomical organizationof aortic arch variations in the India: embryological basis and review. J Vasc Bras. 2006, 5:95-100. Poonam, Singla RK, and Sharma T. Incident of anomalous origins of vertebral artery-anatomical study and clinical significance. J Clin Diagn Res. 2010; 4(3):2626–2631. Momma K, Matsuoka R, Takao A. Aortic arch anomalies associated with chromosome 22q11 deletion (CATCH22). Pediatr Cardiol. 1999; 20: 97–102. Adachi B, Das Arteriensystem der Japaner. 1st Ed. Vol. 1. Veriag der Kaiserlich-Japanichen Universitat, Kenyusha Press, Kyoto, 1928, pp. 29–41. Mc Donald JJ, Anson BJ. Variations in the origin of arteries derived from the aortic arch in American whites and negroes. Am J Phys Anthrop. 1940;27: 91–107. Natsis KL, Tsitouridis IA, Didagelos MV, Fillipidis AA, Vlasis KG, Tsikaras PD. Anatomical variations in the branches of the human aortic arch in 633 angiographies: clinical significance and literature review. Surg Radiol Anat. 2009;31:319-323. Ozlen Karabulut, Kenan Iltimur, Cudi Tuncer M. Coexisting of aortic arch variation of the left common carotid artery arising from the brachiocephalic trunk and absence of the main branches of right subclavian artery: a review of the literature. Romanian J Morphol Embryol. 2010; 51(3):569-572. Moore K, Persaud TVN. The developing human: Clinically orientedembryology. Philadelphia: Elsevier Science, 2003, 364-366. Paraskevas G, Agios P, Stavrakas M, Stoltidou A, Tzaveas A. Left common carotid artery arising from the brachiocephalic trunk: a case report. Cases J. 2008; 1:83. Gupta M and SodhiL. Variations in branching pattern, shape, size and relative distances of arteries arising from arch of aorta. Nepal Med Coll J. 2005; 7(1):13-17. Satyapal KS, SS Partab P, Kalideen JM and Robbs JV. Aortic arch branch variations – case report and arteriographicanalysis. South African J Sur. 2003;41(2): 48-50. Ogeng'o JA, Olabu BO, Gatonga PM, Munguti JK. Branching pattern of aortic arch in a Kenyan population. J Morphol Sci 2010;27(2):51-55. Bernardi L, Dettori P. Angiographic study of a rare anomalous origin of the vertebral artery. Neuroradiology. 1975; 9: 43–47. Stone WM, Brewster DC, Moncure AC, Franklin DP, Cambria RP, Abbott WM. Aberrantright subclavian artery: varied presentations and management options. J Vasc Surg. 1990; 11: 812–817. Kieffer E, Bahnini A, Koskas F. Aberrant subclavian artery: surgical treatment in thirty-three adult patients. J Vasc Surg. 1994; 19: 100-109. Azakie A, Mc Elhinney DB, Dowd CF, Stoney RJ. Percutaneous stenting for symptomatic stenosis of aberrant right subclavian artery. J Vasc Surg. 1998; 27: 756–758. Brown DL, Chapman WC, Edwards WH, Coltharp WH, Stoney WS. Dysphagia lusoria: aberrant right subclavian artery with a Kommerell?s diverticulum. Am Surg. 1993, 59: 582–586. Bahnson HT, Blalock A. Aortic vascular rings encountered in the surgical treatment of congenital pulmonic stenosis. Ann Surg. 1950:131: 356–362.